Weekend in the County and a spot of fitness testing! On Friday morning David and I packed up the van and drove to the County for the weekend. We decided to head to Hepburn to have a look around as neither of us had climbed there before and we had heard good things. When we got there it was pretty warm but we headed up the hill to have a nosey at some problems. 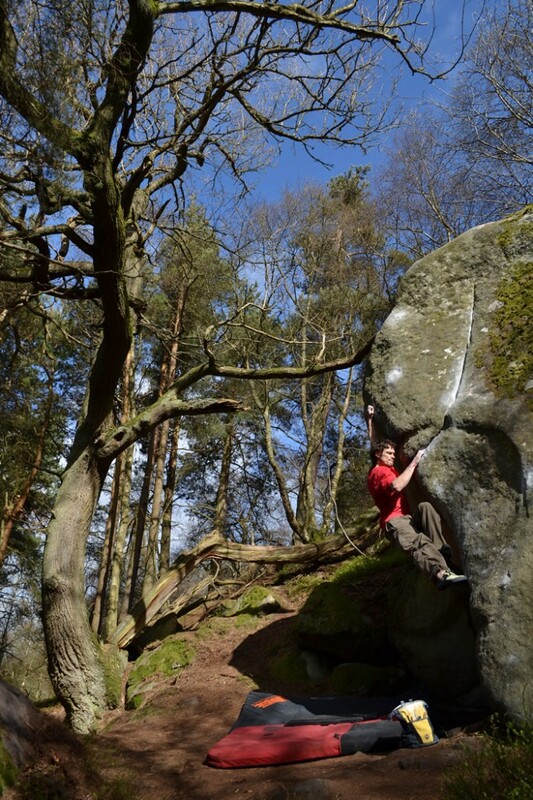 One of the problems I had heard about was Preparation H, an 8A (/7C+) line up a big sandstone bloc. It was brilliant to look at and I was psyched immediately! 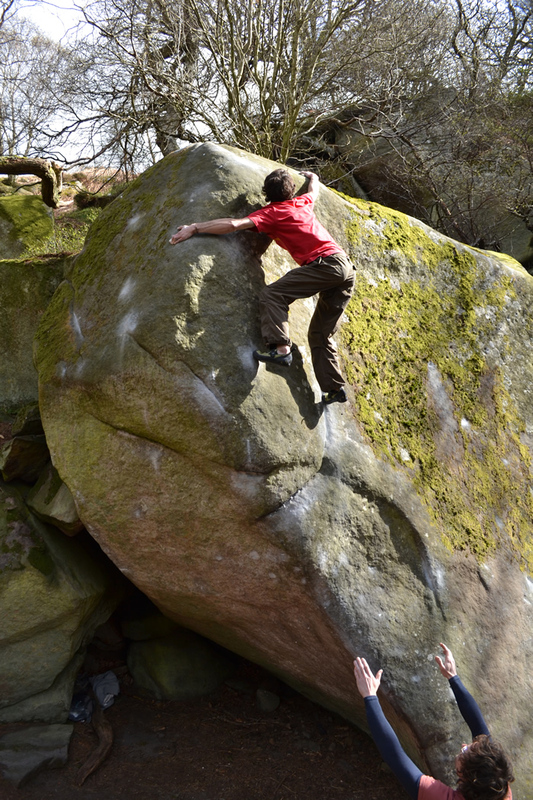 We warmed up on some cool problems, and then went and had a look at the Titanic boulder nearby. A fun 7A+ bloc with a pockety sit start into a lay back arete, this was a good start to the day. We then headed over to Preparation H to begin working it out. David decided to wait for it to cool down a bit but I was overexcited (and generally have pretty good skin) so I got stuck in. 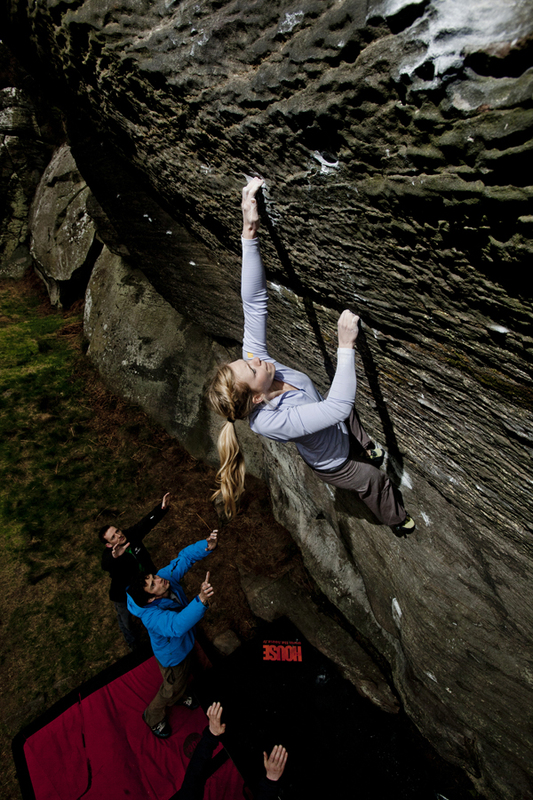 The crux of the problem soon became clear – a difficult foot movement early on, strenuous but do-able. David pushed me through the start so I could have a go at the end part and having sussed it I had a rest before giving it a go. 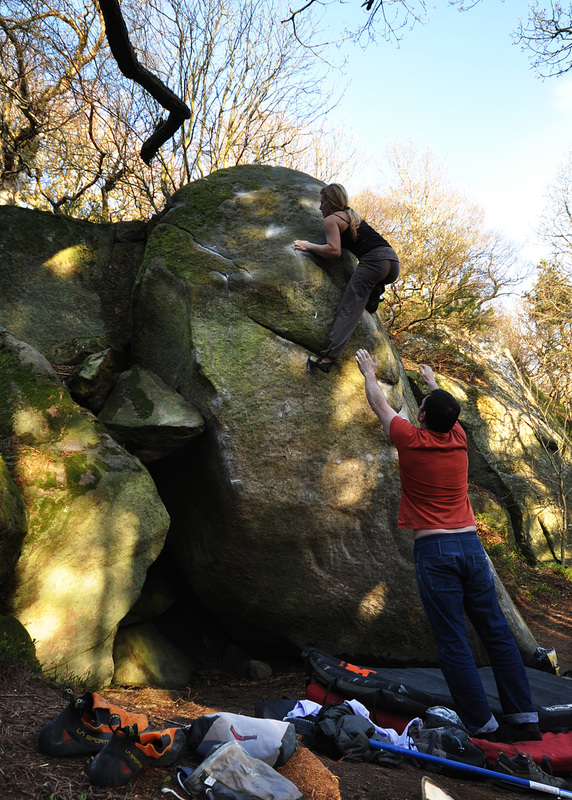 I was stunned on my first go after a rest to find myself through the crux and moving onto the slopers…and to the top! 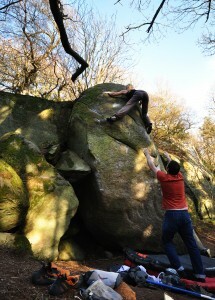 Very happy to do this boulder (albeit in a bit of a shaky fashion -my hands were sliding on the warm holds at the top!). Feeling in high spirits I then did Nothern Soul (7A+) next to it, a very cool high problem with a bit of a scary top, and Trivial Pursuit (7C), another brilliant problem. David wasn’t having much luck due to warm holds, bad skin and tape so he decided to stop and try again on a colder day- the next day he did all the mentioned problems! After what turned out to be a tiring Friday, we camped in the van and then I headed off early in the morning to Teeside University for Team Training. This training was fitness testing. To give it a context, we do a session here in October and then again in March before the season starts. The October testing helps us to highlight training goals and weaknesses and the March one shows us if we have improved or not! To cut a long story short I had improved on the majority of the tests and by quite a substantial amount 🙂 This was really reassuring as I have busted a gut training this year! One of my personal enemies has been the bleep test – for those of you who have taken it I am sure you will agree it is an evil thing. It aims to measure your aerobic capacity through a running test that gradually speeds up until you drop out from fatigue or are unable to make the distance in time. A cruel business. In October I was appalling in this test as I hadn’t done any running or aerobic training for some time. I am happy to say that I did a lot better this time – running all winter (even in the snow!) has paid off :). Thanks to Dom, Rebecca and the Teeside team for all their help and support. After this day at Teeside University I went back to the County to meet up with David, Andy, Rob and Lee. While I had been at Teeside, David had been not only to Hepburn but also to Back Bowden and had successfully climbed County Ethics – a problem I was keen to try. On Sunday morning we headed back to the problem so I could have a little go. This problem is high! I tired the start but I found myself at a move I could not commit to without having tried the top so I popped a harness on and went to have a look. I brushed the holds and did the top moves on a rope absolutely fine, including a big move that, when held, signals the end of the hard section. I tried it from the bottom but again I stuggled to commit to the big move a number of times, jumping off onto the pads. It is very frustrating when the main thing holding you back is mental not physical. I got frustrated and got on one more time with my head in a good place – I went for the move and held it but my foot popped off and I lost the hold as I readjusted my grip! Gutted. I took the fall and was fine but mentally I was drained. Another time, another trip! Now I am back in Sheffield, getting nervous and psyched for the first World Cup of 2012 in China. Alex and I fly next week, wish us luck!